This is a "get ready for tennis" class where the focus is on developing motor skills, athletic skills, tracking and hand-eye coordination. Children learn to trap, hit off the roll and volleys through interactive games. More importantly, it's about having FUN! Understand concept of "same" and "different"
Understand concept of "mine" and "his/hers"
Players learn the basics of tennis through fun, interactive methods of teaching. Classes focus on developing basic athletic skills, tracking, hand-eye coordination as well as fundamental tennis skills through games. Children learn to hit off bounce and volleys through interactive drills and games. Players develop athletic skills that help them be better tennis players. In addition, players learn fundamental tennis skills including the basic strokes - groundstrokes and volleys, as well as overheads and drop-hit/feed. Classes focus on swing path fundamentals with each stroke through fun and interactive methods of teaching. Players also get introduced to scoring in a fun, cooperative and competitive environment. Players learn technical and tactical tennis skills, while continuously building athletic skills. 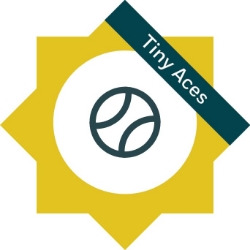 Classes focus swing path fundamentals, classic grip and stroke development for the basic strokes learned in Little Aces and get to learn a new stroke - the serve. Players also learn how to keep score and rally in a fun, competitive environment. Racquet size: 23" & 25"
Players learn technical and tactical tennis skills, while building athletic skills. Classes focus on stroke development, classic grips, and swing path fundamentals. Players learn how to keep score and rally through game play in a fun, competitive environment.